Aly Carter graduated from high school 13 years ago, and what she remembers most distinctly about those years were her experiences on the playing fields. She ran cross-country and track, played soccer and threw herself into lacrosse, helping her school team make it to the state final in 2005. She barely remembers her high school teachers, as her classes and teachers rotated, preventing her from passing much time with any particular one. But she spent four years with several coaches and remains connected to some of them. “I always became close with my coaches,” she said. “I learned my greatest life lessons in team and individual sports." Nearly 8 million teenagers played for their high school teams during the 2017-18 academic year, many of them occupying hours after school under the guidance of various head and assistant coaches. For many of these kids, their coaches reached them in ways their teachers couldn’t, and what they learned on the soccer field or basketball court has stuck in a way that a lecture on the French Revolution did not. Much of this disparity has to do with the adolescent brain. “These young athletes are pulled into powerful situations where they’re directly engaging physically with other people,” said Mary Helen Immordino-Yang, professor of education, psychology and neuroscience at the University of Southern California. Unlike in the high school classroom, where learning is often abstract, students playing sports are carrying out physical activity in physical space, often in the company of others. The learning is direct and clear. And the interactions with teammates often elicit powerful emotional responses at a time when the adolescent brain is highly susceptible to social cues and hierarchies. “Where there are powerful emotions, there are tools for learning,” Immordino-Yang said. Of course, not all coaches are effective, and some kids will take home destructive lessons and sour memories from their sports experiences. Even worse, the intimacy of the coach-athlete relationship can morph into abuse. But sports remain the most popular extracurricular activity for children ages 6-17, ahead of religious education, music, dance and art. For better or worse, coaches affect child development. And the relationships often go both ways: Students know their coaches more personally, too, and see them as fully fledged adults rather than educators at a podium. Will Sangree, now 28, remembers the time commitment his high school lacrosse, cross-country and hockey coaches devoted to their teams. Practice and game time, team dinners, bus rides — “they invested so much time in us, I definitely knew them better than my teachers,” he said. Sangree remembers observing his coaches with their children, and noting that how they interacted with their own families had a powerful impact. It felt natural seeing a coach in different settings and taking on various roles, whereas running into a teacher out of school “was a weird, out-of-body experience,” he said. Working together toward a shared goal. Shane Murphy, a professor at Western Connecticut State University and former president of Exercise and Sports Psychology at the American Psychological Association, often starts his sports psychology course by asking students if the class is a team. The students always say no. “That’s because we don’t have shared goals,” Murphy explained. Everyone is graded individually, and classmates’ performances have no bearing on the other students. 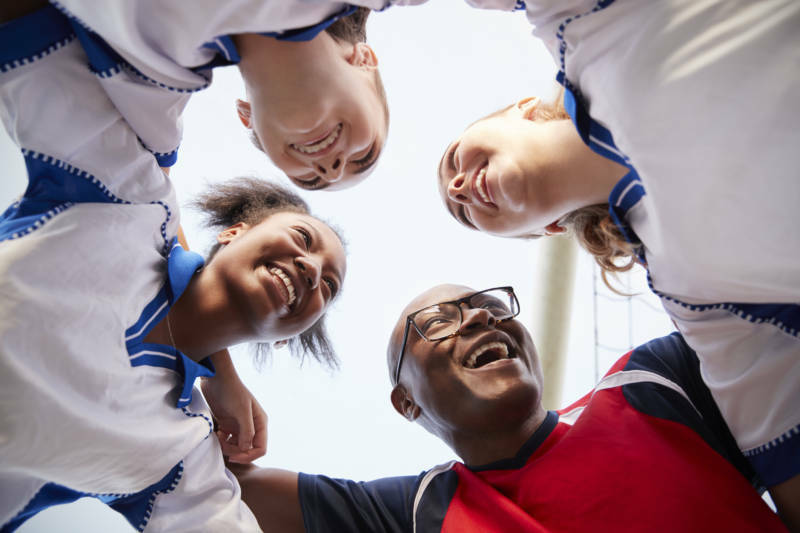 On sports teams, players are often interdependent, and effective coaches underscore the need for unity and work toward a common goal. “Coaches are involved in helping individuals feel a part of something bigger than themselves,” Murphy added. Tailoring motivation to the individual. To be sure, dedicated and experienced teachers work to teach children in a way that they will best understand. But teachers working with dozens of kids in multiple classes aren’t afforded the time to know what sparks every student. Good coaches, on the other hand, who often spend countless hours with their players, will motivate each one depending on her personality and nature — knowing that a quiet word of encouragement to one child won’t work with another, who might respond better to blunt feedback. Because coaches often have a deeper understanding of the kids on their team, they are better able to tailor their motivation to the child in front of them. Providing adult friendship. Research on child development shows that teenagers who have healthy relationships with adults other than their parents are less apt to bully or experience depression and are more inclined to engage in school and their community. For some students, coaches play this role. Aly Carter remembers her high school coaches interacting with her more casually than her teachers. “My coaches came down more to my level, while my teachers were more like authorities,” she said. That informality removed barriers to a relationship and allowed her to build lasting bonds with caring adults. Lynch had a similar memory about her high school sports experiences: “I got to form real friendships with adults and was given responsibility from people other than my parents,” she said.